I’m writing a quick blog about my usual “Day of Rest”, Sunday. Breakfast at my local eatery, Charlie’s Homestyle Diner, is time to enjoy the news of my community and the special of the day. 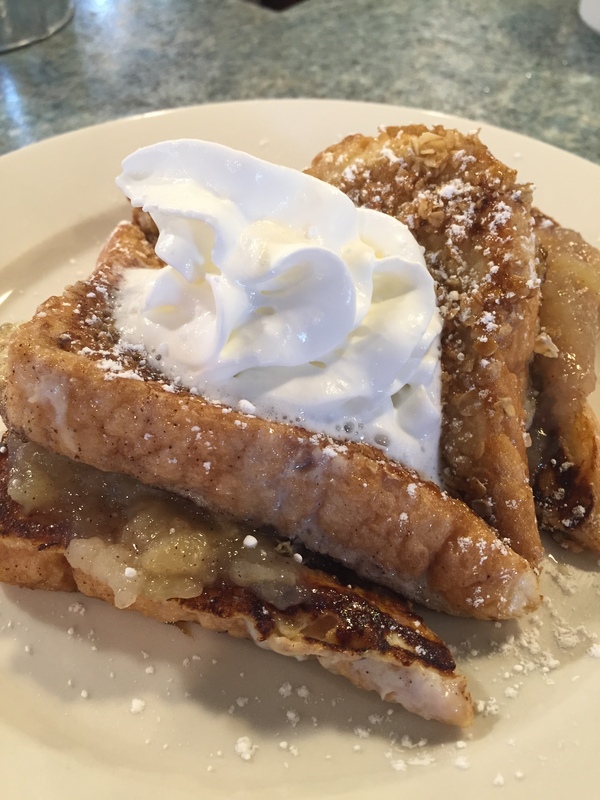 In this case, Apple Stuffed French Toast, made from scratch. Last Sunday I spent the day with family and Friends, playing Bingo. Janice won about $200, my sister Vickie sadly called bingo too late, my niece won $30 and I didn’t win but enjoyed the company of my loved ones. Today’s goal are to stay home, relax, and catch up on Emails and social groups. Breakfast of Shredded Wheat, made like my Dad always had it; Run under hot water, drained and a pad of butter. Simple enough to bring back a fond memory of breakfast with my Dad, Nelson. Scan my husband’s photo album and cuddle up with Ninja Buddy. The weather forecast for this last day of January 2016 is for temperatures in the mid-forties. Here in Merrimack, Hillsborough, New Hampshire at 11:20 am the temperature read 45 degrees on the overcast Sunday morning. I end this post stating goals met, including 4 loads of laundry. It has been a productive morning since I awakened at 5:30 am. [A late start for me.] I will sit down with a lunch of homemade apple salsa, baked cranberry corn chips and a cup of hot spiced apple cider. Ninja Buddy is anxiously waiting for our cuddle time. Enjoy whatever you decide to do today. Just remember to take time for family and self.